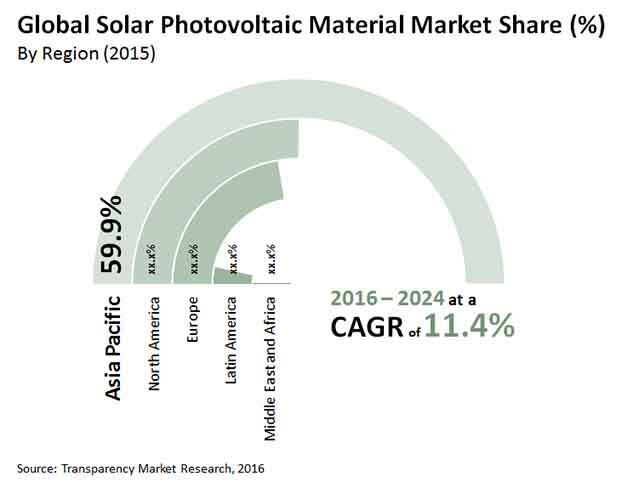 the global solar photovoltaic (PV) materials Market is highly fragmented owing to the presence of a large pool of participants. Transparency Market Research (TMR) states that the top four players, namely Applied Materials Inc., BASF SE, Shin-Etu Chemicals Co. Ltd., and Wacker Chemie AG, contributed for a little more that 44% to the global market in 2015. However, the leading players are gaining significantly from their technical expertise and experience, making it difficult for small and new players to compete with them. Nevertheless, extensive advancement and continual innovations demonstrated by small companies are most likely to help them grow, and compete with international players. In the report, Transparency Market Research has estimated that from the valuation of US$7.55 bn in 2015, the global market for solar PV materials is expected to attain the value of US$19.60 bn by the end of 2024. This market is expected to expand and a healthy CAGR of 11.4% during the period 2016-2024. Solar photovoltaic materials have a wide range of applications in the commercial and industrial sectors. The studies have shown that demand for solar photovoltaic exhibited by these sectors are most likely to bolster the growth in the global market of solar photovoltaic materials market. The increasing installation of solar PV in commercial buildings, such as hospitals, shopping complexes, malls, and airports to make them independent source for generating electricity, is expected enable the market witness growth at an increased pace. Owing to the aforementioned applications, the commercial sector is anticipated to emerge as the leading application area of solar PV materials over the forecast period. Geographically, Asia Pacific held the majority of the global market in 2015, accounting to 60% of total share. Furthermore, Asia Pacific is expected to sustain its dominating position owing to the growing trend of generating electricity from renewable sources and high demand for photovoltaic installation in the power industry. However, the North America market for solar photovoltaic materials is expected to showcase lucrative prospects, attributing by the growing environmental awareness in the region. The rising concerns regarding the environmental problems due to the increasing use conventional energy sources such as coal and oil are the key factors behind adoption of solar energy. The increasing carbon footprint and greenhouse gas emission are motivating consumers to demand for clean energy, in turn fuelling the demand for solar panel installations. The research activities undertaken to discover new materials with power conversion efficiency and low manufacturing cost are expected to bolster the global solar photovoltaic materials market in the near future. Furthermore, strict rules and regulations implemented by governments to reduce the carbon emission are benefiting this market, boosting its growth globally. Although, solar power is considered as clean energy, the materials used are very difficult to recycle or to reuse, which causes adverse effect on environment. Also, the space required to produce significant amount of energy through solar power is very large, which may restrict the market for solar photovoltaic materials from growing. Furthermore the high installation and high maintenance cost associated with it could hinder the market’s growth. Materials such as copper indium diselenide and cadmium telluride are cheaper, but have low power conversion efficiency. Market players are thus continuously investing in research programs to increase the efficiency of solar photovoltaic materials they offer. Governments around the world are encouraging scientists and researchers to develop technologically advanced processes, which is expected to boost the global solar photovoltaic materials market in the coming years.